The northern lights are a spectacular natural colour display of light in the dark night sky, in relatively high latitudes near and in the polar zones. They occur in the in the ionosphere 100-250 km above the earth’s surface, where the solar winds bring gas of free electron and positive ions. This wind hits the earth’s athmospheric shield with a velocity of about 400 km/s with a density of about 5 ions/cc, and magnetic field intensity of about 2-5 nT (nanoteslas). Magnetic storms can develope much faster flows and the IMF (interplanetary magnetic field) may also be much stronger. Aurora was a Roman godess of dawn and the Greeks called the north wind boreas. The colour of the northern lights usually is green, but sometimes shows faint red like sunrise from a strange direction. 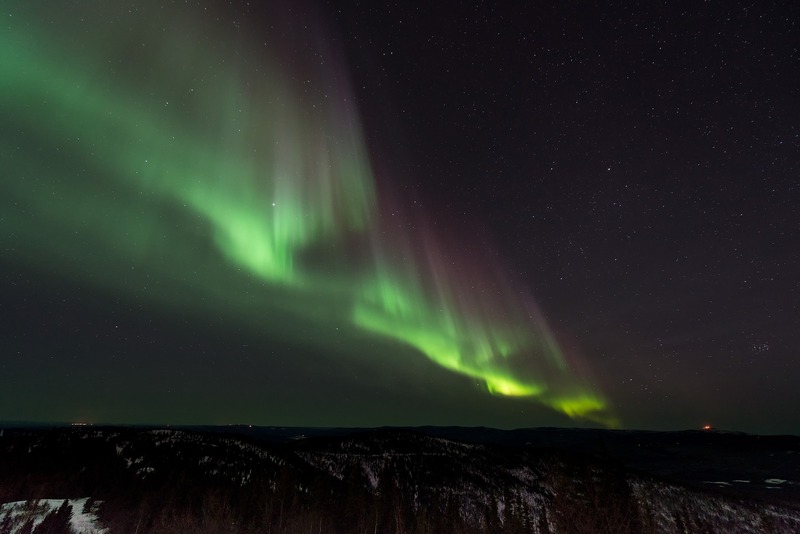 The Cree nation in North America call this natural phenomenon “The dance of the Spirits”. Iceland is ideally located for those who are interested in watching this unforgettable colour display in the night sky beween the end of August and mid April each year. The country is in the middle of the most active zone of the northern hemisphere. To enjoy this properly, people have to get away from the light pollution of inhabited areas, preferably to totally dark surroundings. Usually they are within short reach of towns and villages.